Vitamin B12 is involved in the manufacture of red blood cells and is required for a healthy heart, as well as for a healthy nervous system. As it is found mainly in animal based foodstuffs such as meat, practitioners frequently recommend this particular B vitamin to vegetarians and vegans. 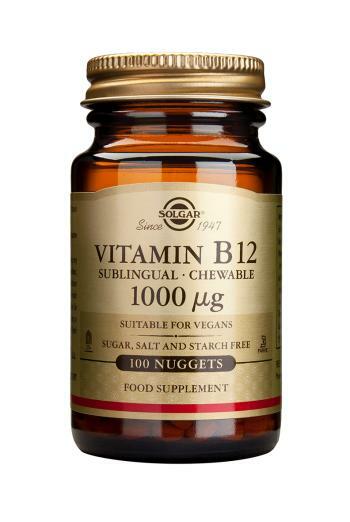 As a food supplement for adults, one (1) Vitamin B-12 nugget daily, preferably at mealtime, or as directed by a health care practitioner. May be placed between the cheek and gum or under the tongue and allowed to dissolve. Nugget may also be chewed or swallowed whole. mannitol, magnesium stearate, stearic acid, natural cherry flavour. 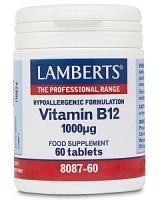 Lamberts Vitamin B12 helps the manufacture of red blood cells, a healthy heart, and a healthy nervous system.